Throw blankets are finding their way into bedrooms and living rooms across the country. 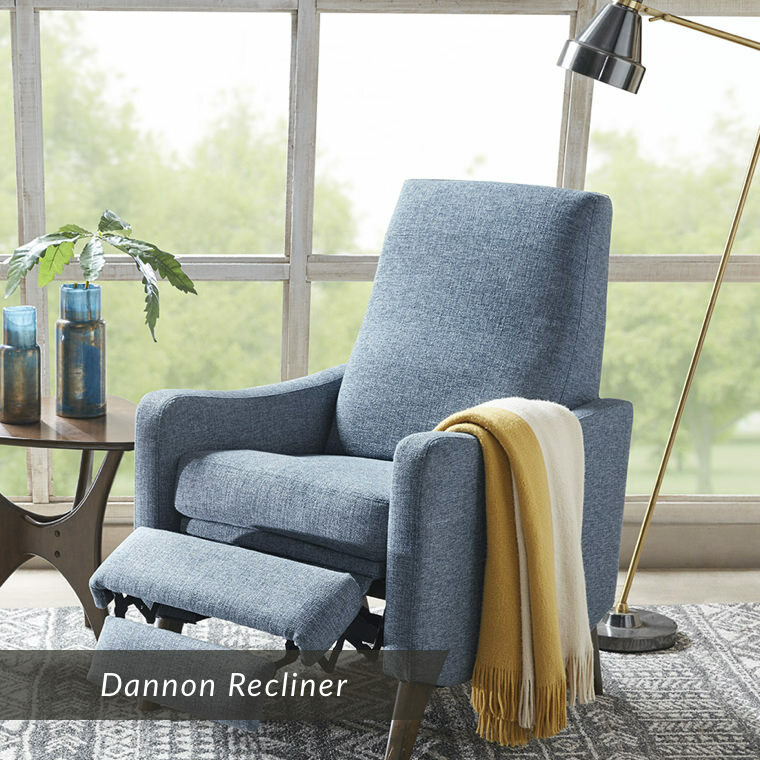 It seems as though it is impossible to flip through a magazine or design website without seeing these cozy accentuations draped over couch and sofa backs, bed edges, and accent chair arms. 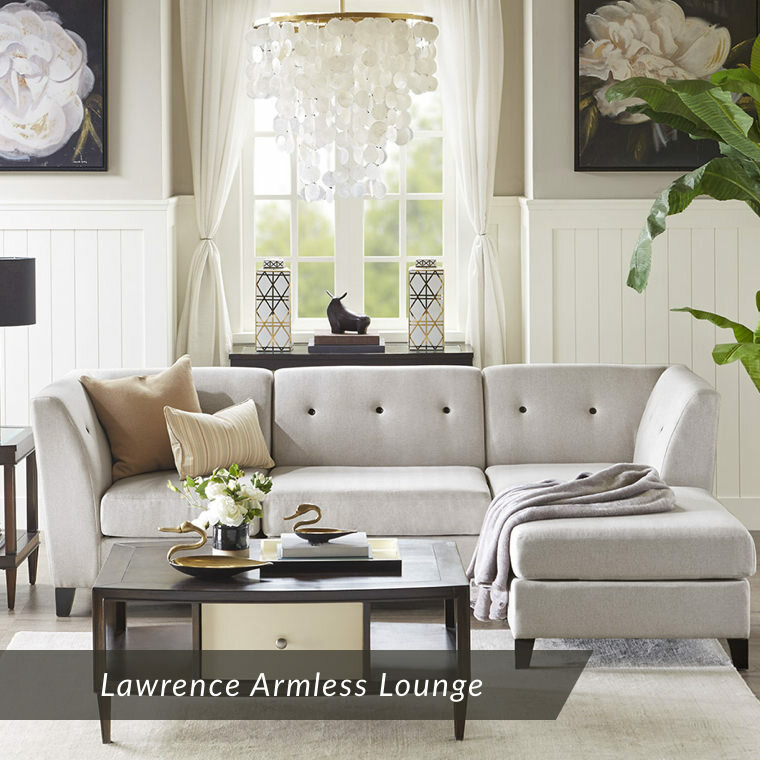 Not only are these pieces trendy, but they are also an excellent way to balance rooms, add warmth (both in style and in the application), and make a style statement without breaking the bank. Designer Living offers an array of throw blankets, and in this article, we will not only list our top ten throw blankets for fall this year, but we will also give some tips and tricks for how to use, decorate, and style with these high quality and versatile accent pieces. Before we dive into our Top 10 throw blankets for fall this year, let’s talk a bit about how to deploy these cozy accouterments correctly. While a well-placed, aptly chosen throw can add a classy bit of texture, warmth, and tone to a room, a less strategic application of the same blanket can leave a room looking more disheveled and clashing than before. With these tips and tricks, you can be sure that you are not only choosing the right throw for your space but deploying it correctly as well to maximize stylistic and functional benefits. Ever wonder why these pieces are called throw blankets? Just try taking your favorite throw and tossing it over the back of a high-back accent chair or let it fall lazily off the rear corner of a sofa. This messy orientation allows for flow and playfulness in a room and creates a laid-back look. We like to use blankets and throws with fringed edges to deploy this technique. 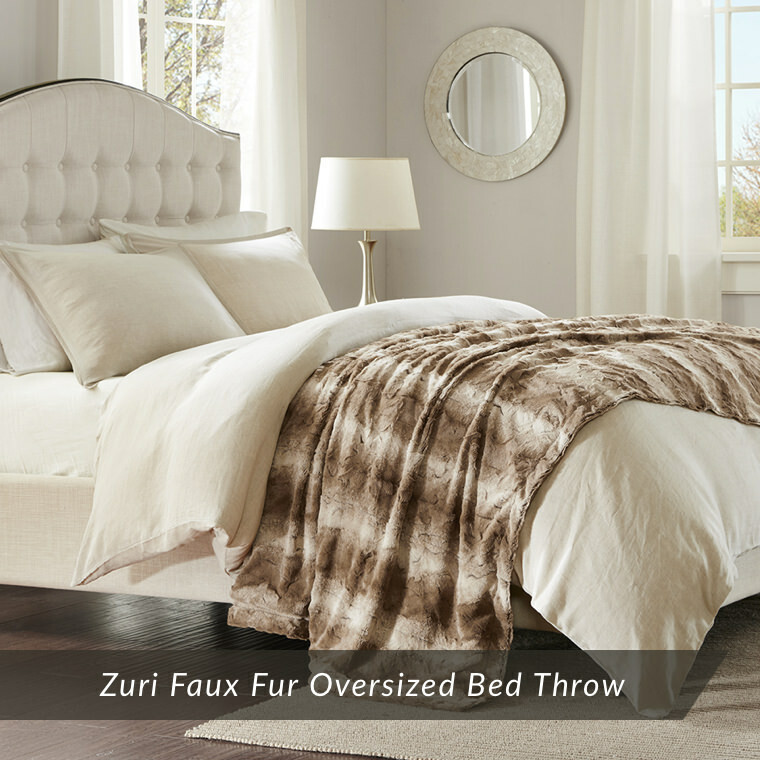 Faux fur throws work fantastically with this orientation. Faux fur throws are some of the best soft throw blankets available. Fur is meant to be messy, and draping it in a way that adds ruffles and folds brings out all the warmth and coziness this material has to offer. The opposite end of the spectrum when it comes to throw blanket draping techniques is to fold it tidily over the arm of a chair or sofa, or at the edge of a bed. Solid colors work best with this application, and this orientation adds both sophistication and smooth texture to any room. One unique application for a throw blanket is to drape it over the center of your headboard. We love patterned blankets for this usage, and this could be an excellent application for that special blanket that is just a bit too nice to drape over a living room chair. Using velcro is a fantastic way to keep it in place. Fold a throw blanket lengthwise and drape in cleanly over the center of your favorite accent chair to add color and texture. For extra pizzazz, try folding a second contrasting throw into an orientation with less width and layering it on top of the first. This application is also a sneaky, budget-friendly, and stylish way to get more life out of a chair whose upholstery is fading or weathering. It’s not just about ‘how’, ‘where’ plays a significant role in choosing a throw and applying it well. Here we will outline some popular places for throw blankets in the home. No matter how we style our homes, the bedroom is a place that most people want a cozy and extra warm feel. This, of course, makes it a wonderful place to add a throw blanket, which brings warmth and texture to the room. We love throws draped neatly over the feet of beds, where they can accent your existing duvet cover and be layered over the comforter on colder nights. Another great way to use a throw blanket in the bedroom is to drape it messily over the edge of a basket -- creating a ‘spilling’ effect. Faux fur is a wonderful material choice for this application. ‘Spilling’ a throw out of a corner basket is a beautiful way to add messy-chic style to a contemporary bedroom. Your patio furniture may be lacking the warmth and inviting nature of your living room. By bringing throw blankets outside when you are enjoying a drink or summer meal on the deck, you can completely transform the space in just seconds. We like messy, cascading orientations and natural fabrics like wool, alpaca, or faux fur. This is not just a stylistic upgrade, as blankets can come in handy on cool nights. Cozy up by the outdoor fireplace under your favorite and coziest blanket or throw! The classic home for any throw blanket. Depending on your existing decor, throw blankets can be incorporated into a living room in a variety of ways and can function to balance, accentuate, or completely transform a space. Some homeowners opt for cheaper throws which they switch out often to keep things fresh and impress guests with their seasonal decor. Others prefer to utilize lighter colors that are appropriate for year-round use. When shopping for a new throw, do your best to visualize precisely how it will be used. Is this piece merely a decorative accent for your living space? Will it be used to snuggle up under during movie nights? Will it always live in the same place or are you looking to bring this throw with you wherever in your home you might need it? You may love the look of a particular throw for the space you are shopping for, but you must also consider whether it makes sense functionally. If you are shopping for a multi-seasonal throw, consider that certain materials provide a better balance of breathability and warmth than others. Do you have a patio? Are you shopping for throws that you can bring outside with you on chilly evenings? Choose fabrics that can take a bit more wear-and-tear. We love our washable faux fur throws for outdoor applications. Below are listed some of Designer Living’s best throw blankets. Now that we have established an understanding of how to shop for and apply throw blankets in the home, consider these great options when you are ready to buy! 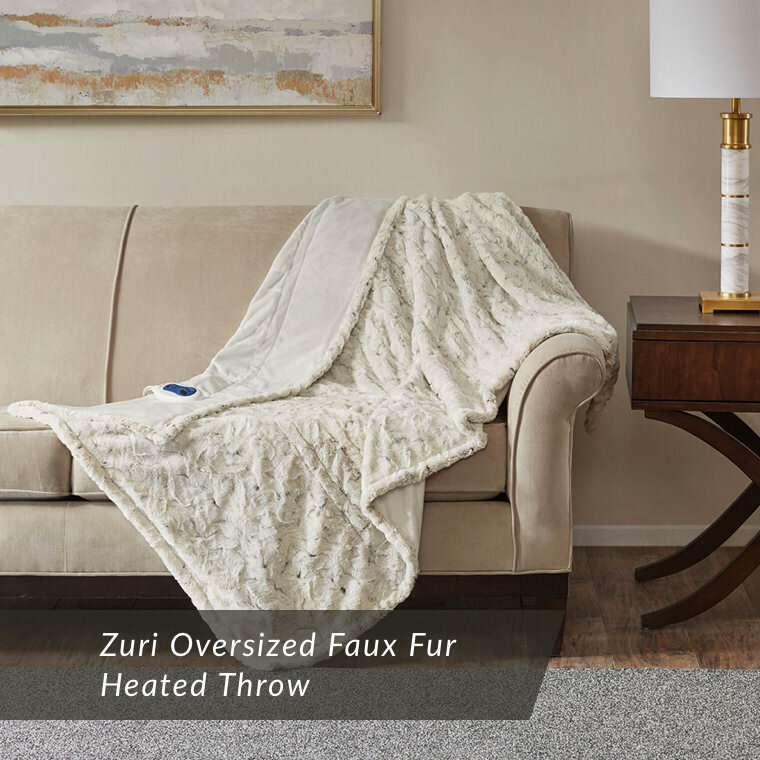 The Zuri Faux Fur Heated Throw is the ultimate in cozy luxury. 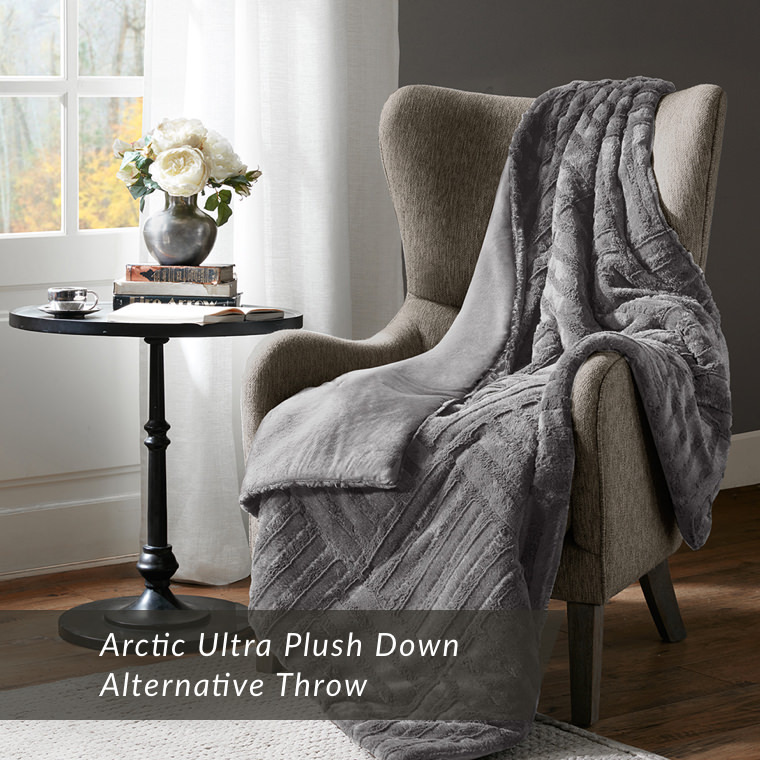 A multi-toned faux fur throw looks great in any room, and this already warm and super soft material just got a massive boost in warmth with electric blanket heating. Advanced heating technology in this blanket senses the ambient temperature of the room as well as the temperature of the throw and adjusts accordingly to ensure maximum comfort. With machine washability and an extra foot of length and width compared to standard throws, this ultra-cozy throw is a fantastic value. 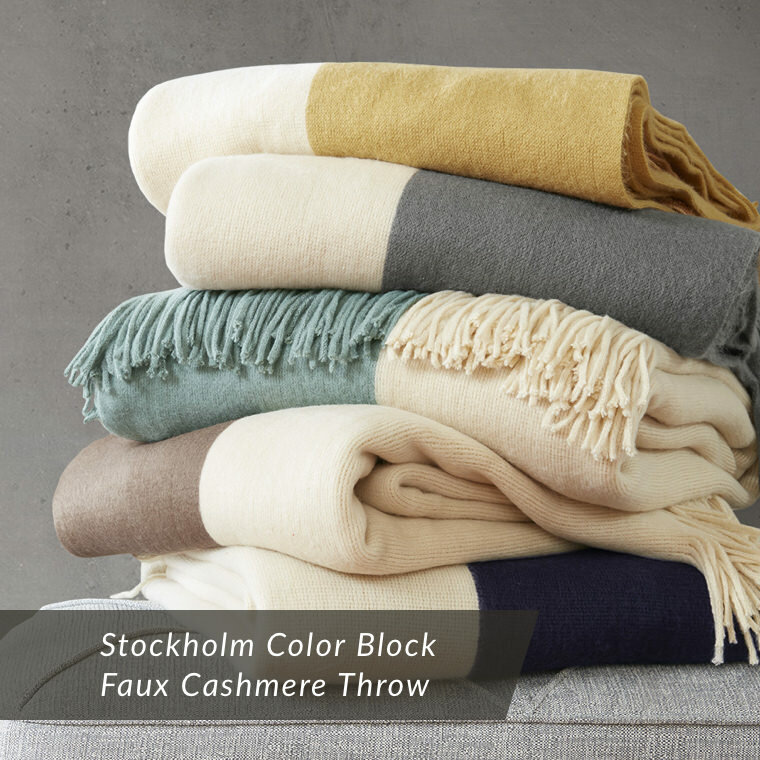 The Stockholm Color Block Faux Cashmere Throw multi-colored throws made of faux cashmere are not only super soft and comfortable, but they are also affordable and great decorative throw blankets, too. Their fringed edges and natural-feeling fabric make them fantastically playful and casual accents, but they are offered in sophisticated tones which simultaneously adds a touch of class to any space. 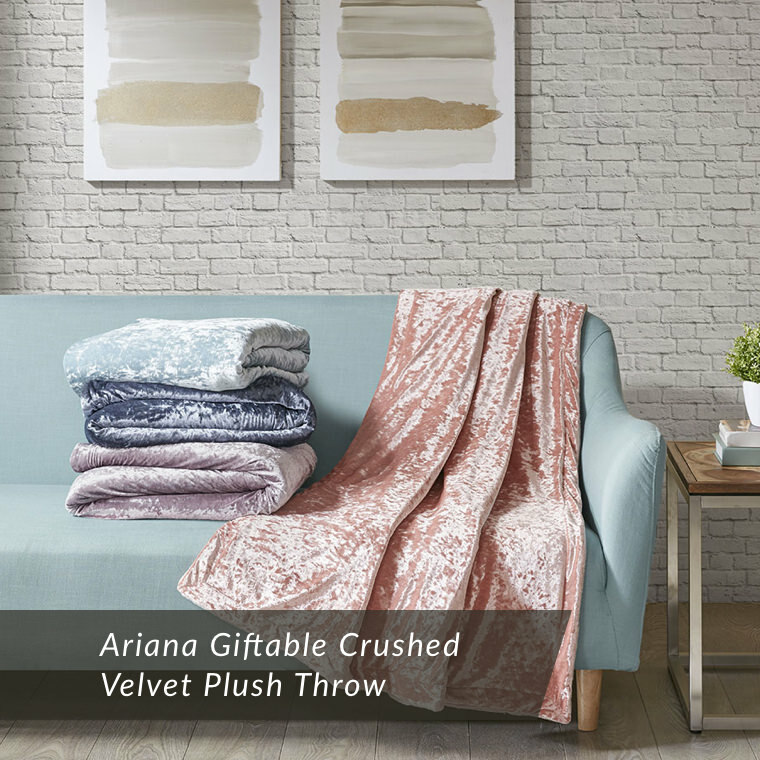 This affordable and fun Ariana Giftable Crushed Velvet Plush Throw is made of crushed velvet which lends a sleek and glimmery modern look. Solid color options and a knife edge maintain sophistication, while vibrancy and soft texture add warmth and texture to your space of choice. These throws are machine washable, so don’t panic when the kids spill hot chocolate! 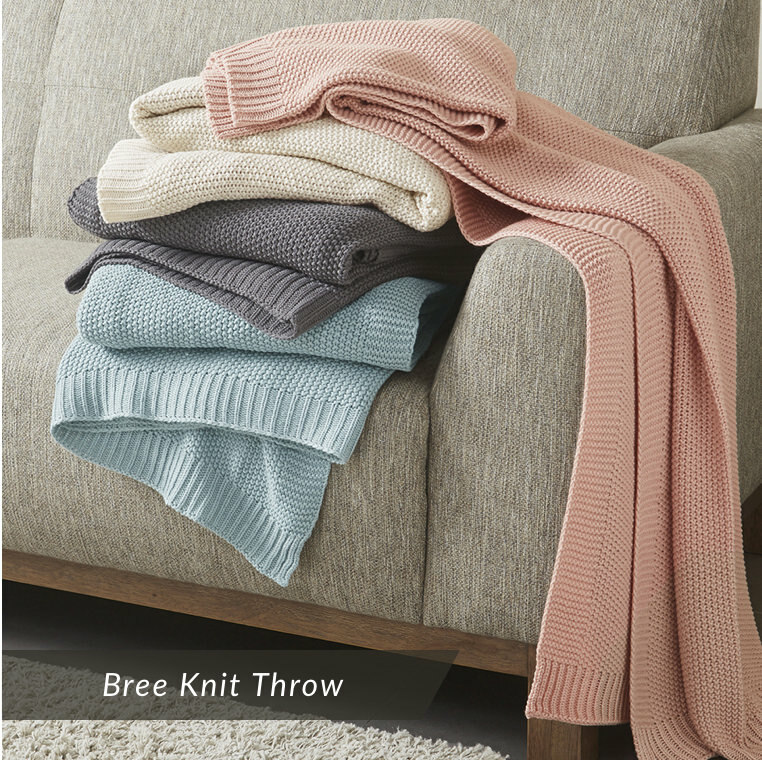 This classic Bree Knit Throw is offered in four mellow, solid color options. This throw provides excellent warmth, is washable, and is particularly versatile in application. You will have a difficult time finding a living room or bedroom where one of these throws cannot be incorporated into the existing design and color scheme. These look great folded neatly on an ottoman or draped messily over the arm of the sofa. 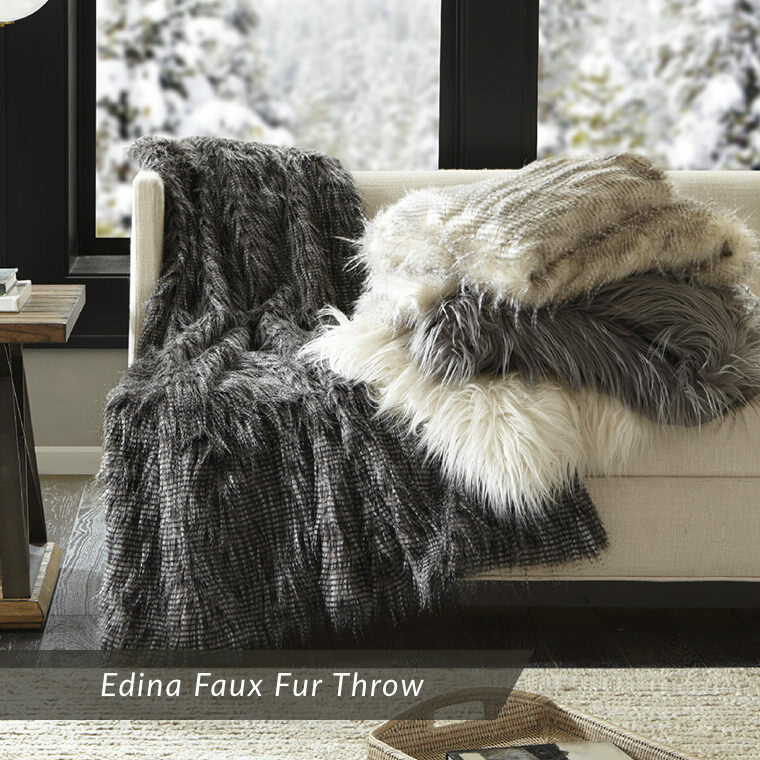 Faux fur is in, and these fabulous Edina Faux Fur Throws will help you achieve a trendy look without sacrificing comfort and functionality - or breaking your budget. With long, premium faux fur on the face, this blanket adds luxurious texture and lush warmth. Faux mink on the reverse side feels lovely against the skin. We love this throw draped across the foot of a bed or tossed messily on the sofa. 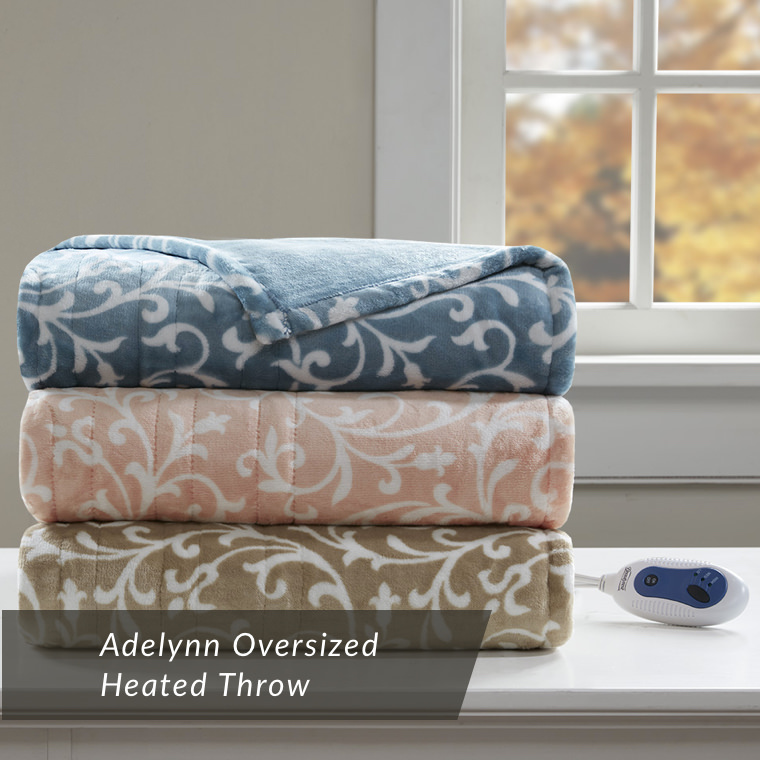 With heating technology, an oversized footprint, and ultra-soft microlight plush fabric, the Adelynn Oversized Heated Throw pinnacle of comfort. The ability to wash this throw in the laundry machine adds peace of mind during movie nights and when hosting guests. A sophisticated abstract floral pattern adds a touch of flair. This is not a summertime throw! 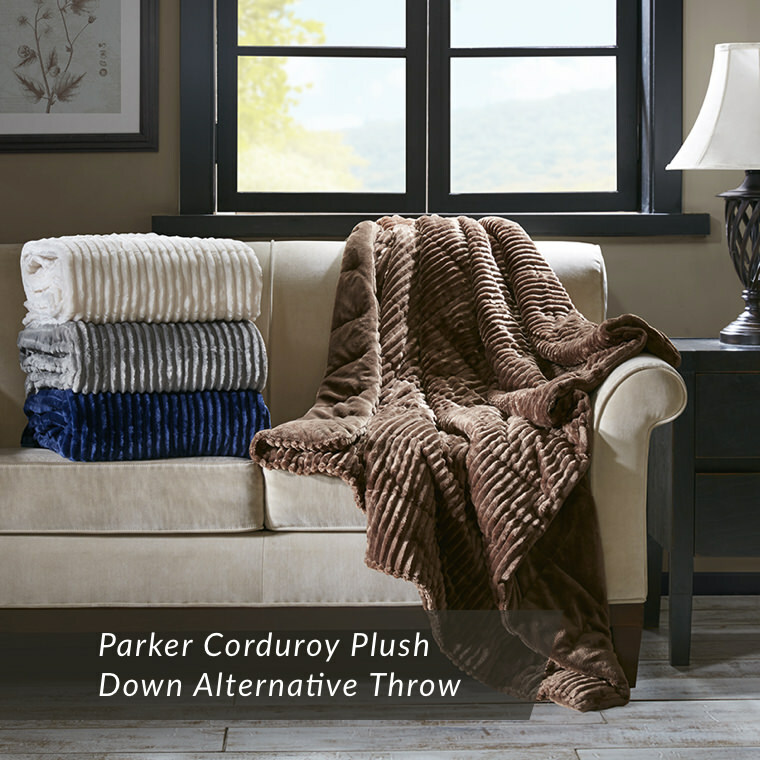 This plush and ultra-warm Parker Corduroy Plush Down Alternative Throw will keep you cozy through the chilly months. Use it as an extra layer on your bed or keep it folded in the living room for snuggly evenings. Machine washability makes this a highly versatile throw. This extra-soft acrylic throw features all-over ruching and two-inch fringed edges. 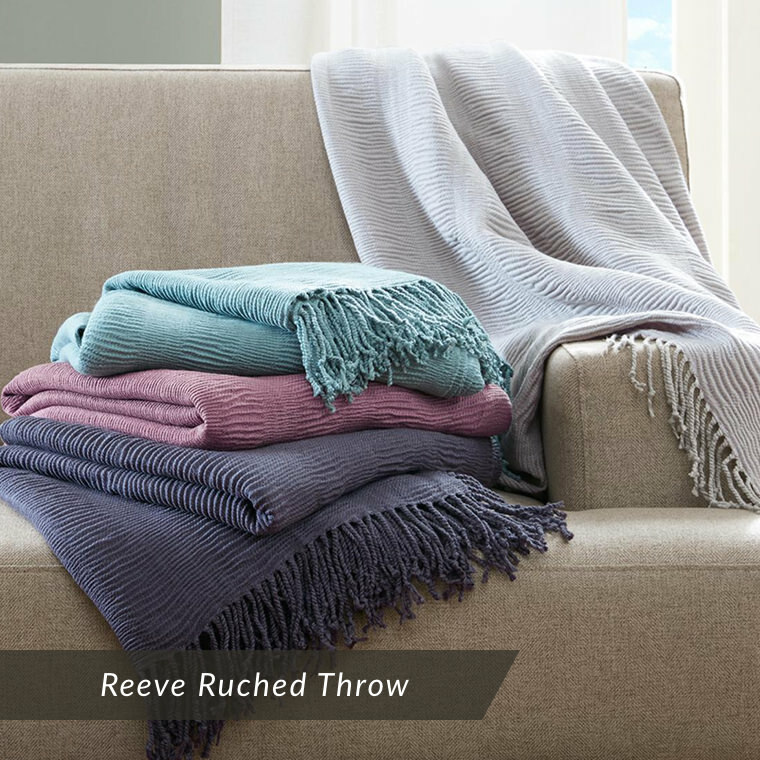 Warm but not too warm, sophisticated but playful, machine washable, and available in four wonderful solid colors, the Reeve Ruched Throw is one of our favorites for this years fall trends. Ruching is very hot right now, and this trendy throw is sure to impress guests while keeping you plenty warm. 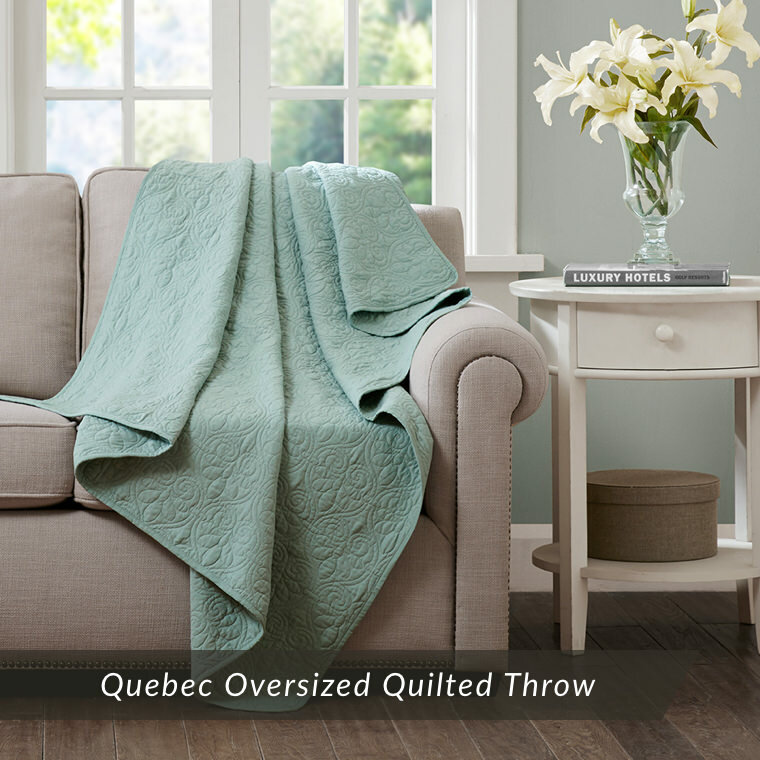 The cozy oversized Quebec Oversized Quilted Throw offers a nostalgic look with classic and elegant stitching patterns. Soft solid tones help it incorporate seamlessly into a variety of existing decors and a 100% cotton fill allows for soft comfort. 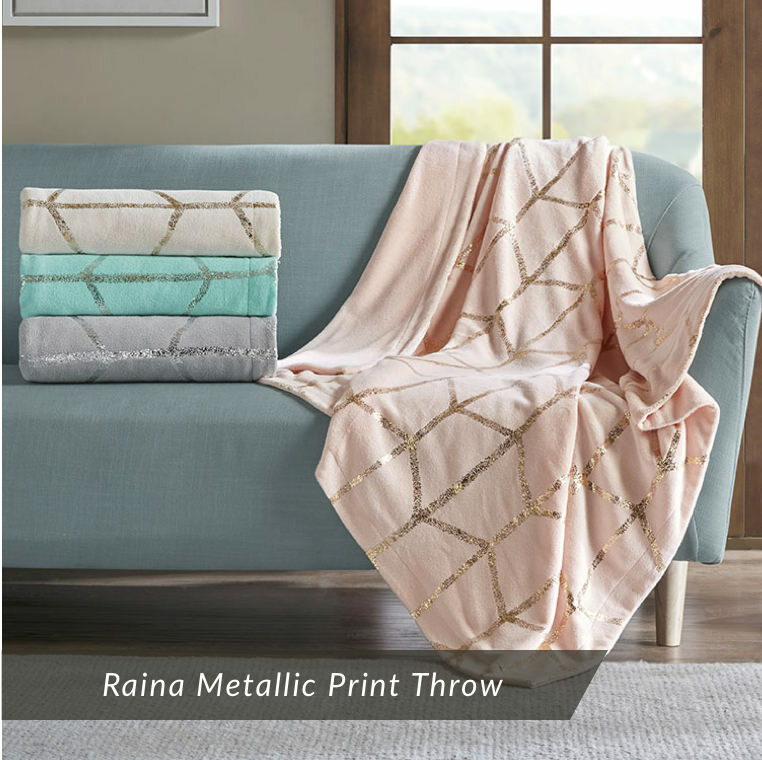 The Raina Metallic Print Throw by Intelligent Design will keep you warm and add great style to any room. The metallic pattern helps create a look that is trending and adds great texture. Offered in four colors, this throw can be added to a multitude of different spaces without compromising on existing tonal schemes and decor styles.